Unable to watch yesterday’s game, the following are based on the impressions as published by 3VV. Sunday’s game featured two distinct periods of 45 minutes each. In the first half, Palmeiras with ease led out 2-0 and could have scored more goals. In the second, Cruzeiro played much better, while Palmeiras committed the same mistakes of the past, in the end allowing the Belo Horizonte team to walk away with the three points. Valdivia played his best game so far since his return to Palmeiras, proving to be on the right way to regain full physical form. Palmeiras dominated the midfield, putting pressure on Cruzeiro high up on the field and turning difficult any constructive play by the opponent. Kleber opened the score on a penalty kick, after Fabrício had been dragged down by a Cruzeiro defender midway into the first half. Shortly after, Marcos Assunção found Maurício Ramos’ forehead for a nice header, resulting in a 2-0 lead as players headed for the halftime break. 9 min: Marcos collides with Farias, hurts his left knee (the same knee where he had surgery done during the World Cup) and is replaced by Deola. 14 min: Roger fires a weak shot that deflects on a Palmeiras defender and leaves Deola without any chance of reaction: 2-1. 20 min: Palmeiras’ defence fails horribly, allowing Montillo to run through and have a clear shot at goal, very well executed: 2-2. 40 min: a good pass finds Faria, just slightly offside, to score the winning goal. 2-3. Palmeiras – as featured in the second half – was again a team without options on the bench, without luck, without force to regain its posture and turn around a negative trend. In stark contrast to the first half, the team again showed its “bipolar characteristics”, reinforced by the fact that Scolari this time was tactically dominated by his opponent. Yesterday’s game marked the end of the first semester. 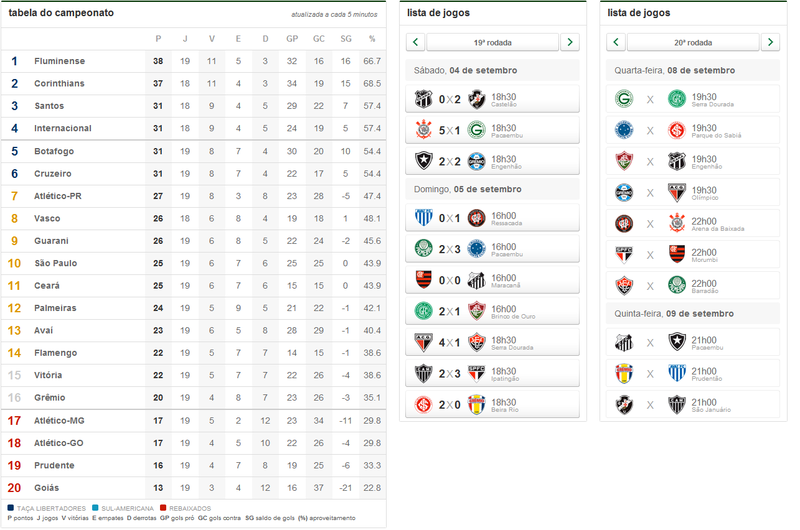 With 19 games played, Palmeiras sums 24 points, parked in 12th place. As Internacional and Santos are in the top four (both already pre-qualified for the Libertadores Cup) at the moment the first six teams gain access to next year’s edition of the most important continental tournament of the Americas. Sixth place is currently held by Cruzeiro, with 31 points. Watch full table by clicking thumbnail. On Wednesday Palmeiras has an away game against Vitória, in Salvador. We all remember Palmeiras’ spectacular win against that same team in the South America Cup a few weeks ago. Thus, expect a rendez-vous with extra chilli.